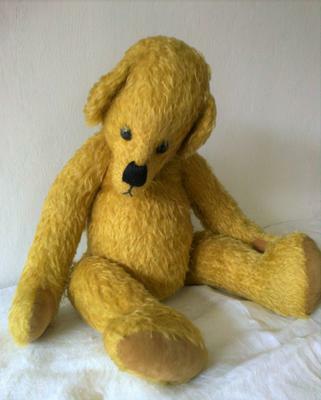 I do hope you can help: I have what I think is an unusual teddy bear. I bought him a few years ago because I'd never seen a bear like him and so would love to know more about his manufacture. 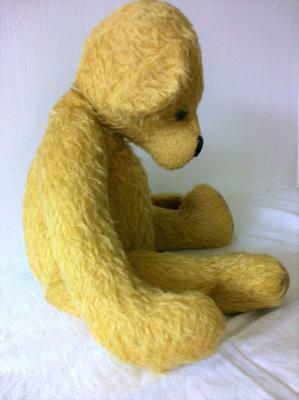 This bear is a lovely golden colour with a long centre-seamed face with shaved muzzle and close set eyes. His nose has a pinched look to it and the end is soft and black. I believe he may be mohair and has velvet paws. Both body and paws feels soft to the touch. He has very long jointed limbs - his arms are so long that they reach the floor when he's sitting down. He's full and round in the tummy area and narrow at the shoulders. As the side-on photo shows, this bear has no hump but does have a comparatively small head with long flat ears on each side rather than smaller ears towards the top of the head like so many other bears. He's in very good condition but has no label and no distinguishing marks that I can see. I believe he may be a Merrythought but only because this has been suggested to me. His body feels as though its filled with rice (or similar) and his limbs feel as though they're stuffed with kapok. This leads me to believe he's more of a modern bear than an older one. He's very heavy bear, around 750g and measures 17 inches tall. I've attached three photos and hope they're clear enough to illustrate this bear's peculiarities. I look forward to hearing more about this bear. Sorry to get back to you so late. I've been really busy. I'll drop you an email in a minute. I so enjoy your comments, that poor lady with her felting too! When I sewed regularly I remember the stabbings - and the language that followed! 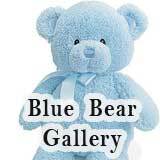 I was under the impression that you were going to make other pages about the other bears that you have/had but you can email photos to me if you want. What would you prefer? I loved reading your comments about the quest for the perfect nose - extremely entertaining. 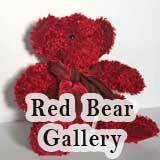 I wonder if there are bears in your collection with tiny little specks of red on them! 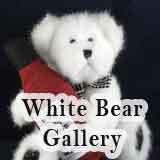 I now have photos of a couple of other bears (one has just been sold) but I don't know how to get them to you. Any ideas? New page here or I can email them to you? I wouldn't say I know a lot about your bear but I can make educated guesses. ;-) Judging by the symmetry of his face and the neat nose embroidery, I'd say an experienced bear artist has made him. Getting the head gusset on straight is one of the hardest things to get right and this one has been done well. The same goes for satin stitching the nose. I've stabbed myself and drawn blood as well as broken a doll sculpturing needle on the quest for the perfect nose. 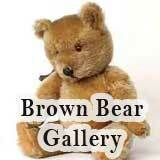 I would be curious to see photos of your other bears if you have the time to share. Sounds like an interesting auction lot. I'm thrilled that you and others out there know so much about my bear - I'm enjoying reading all the comments. There's definitely no tags and he's definitely very different. Along with 'Mr. Golden Bear' there were a couple of others - a green velvet Asquith's Bolshoi bear (currently for sale) and a couple of others who were rather past their prime. One was a mohair type (a lot smaller and less weighty than Mr. Golden Bear) and I'm sure he's around somewhere, so please let me know if you'd like photos. 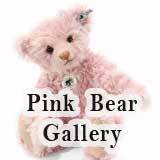 Were there any other mohair bears among the ones you got at the auction? I don't think that he is manufactured. I think this guy was handmade by a bear artist. He could be a one off piece. 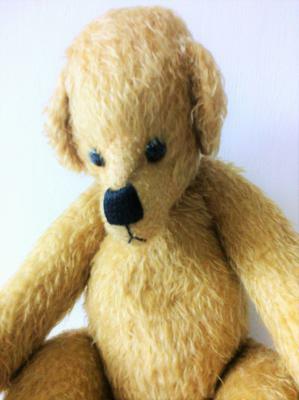 I haven't seen any bear like him but I do have a sparse antique golden mohair that I believe is English. It looks like his designer took what he or she liked from various bears and put them into one creation. The proportions, placement and size of the ears reminds me of a Merrythought Cheeky bear. The shape and proportionate size of his arms are reminiscent of a Steiff bear. The shape of the body is a contemporary design. One of the bears I'm making has that body shape. 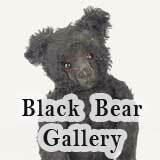 In the handmade artist bear world I've noticed there is a trend towards more unusual looking bears as people look for their own distinguishable style. I think he fits into this trend. Weighting the belly, arms and legs with polyester pellets is a common modern technique since baby beanies appeared. People associate weight with quality. If he's really heavy for his size he may be stuffed with lead or steel shot, glass beads or crushed garnet. He is a beautiful bear for sure, and quite unique. He looks like an original to me, it it possible that he was not manufactured by a company? That would explain the plastic pellets. No tags? Thank you so much for your comments and suggestions regarding my 'Golden Bear.' It makes sense that he's an individual 'exhibition' bear and good to hear that you recognise he has unusual stuffing too. He was bought with several other bears in an auction lot but I can't remember what I paid. I think in his own way he's a real stunner! He's a lovely bear. Where did you get him and how much did he cost? I'm rather curious. He looks like the kind of bear one might find at a bear show. This would account for the unusual pattern and the pellets in his belly, which give him his weight.